Round coffee tables create a perfect spot to engage in intriguing conversations. 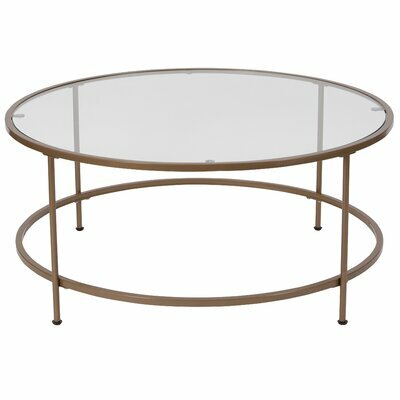 Perfect for central placement, these round coffee tables feature clear round glass and spectacular designs of base. Explore this splendid round glass coffee tables collection and fashion a mesmerizing focal point in your home. Impress your guests and friends with the unique and stylish look of Benford Coffee Table. 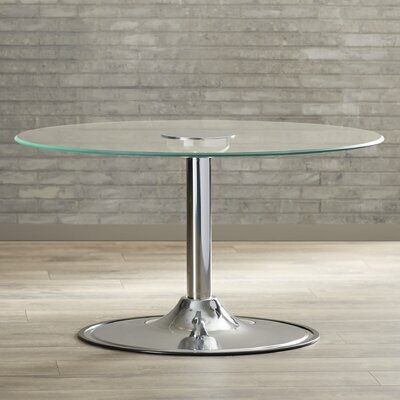 This chic coffee table is round in shape and features chrome finished iron frame and tempered glass. It has four additional pull-out trays that too are circular in shape. These trays serve both as exterior shelves and table tops. You can either pull them out or keep them inserted as per your requirements. This functional and gorgeous coffee table is a smart choice if you love to invite your friends and relatives for dinner or cocktail parties. Featuring a whimsical laser cut design at its center, the stunning Nash Round Coffee Table is sure to surprise your guests. The see-through clear glass intensifies the look of gorgeous laser cut pattern. 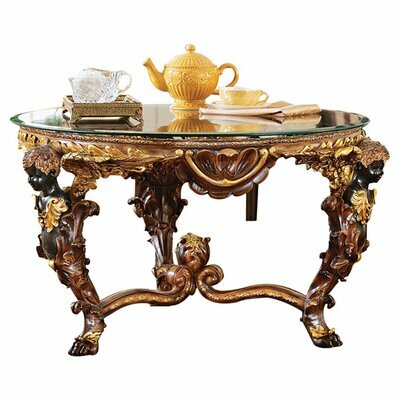 This classy traditional beauty is manufactured from metal with clear glass top. 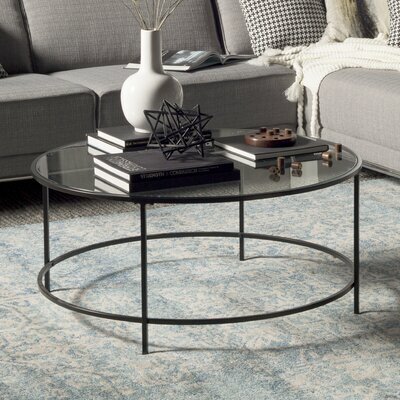 Sturdy metal construction renders strength and maximum durability to this coffee table. The attractive grey finish and brown highlighting of the base adds character and warmth to its overall appeal. 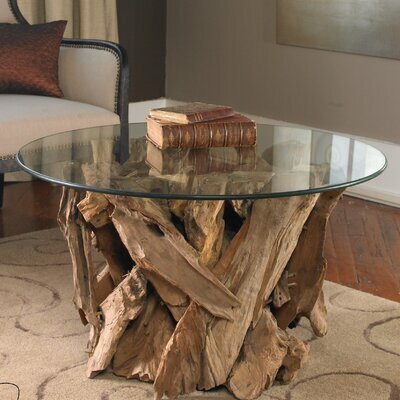 Ideal for small space, this coffee table will become a worthful addition to your home. The minimalistic design and elegance of the Casanova Coffee Table is sure to adorn your modern home décor with its magnificent look. 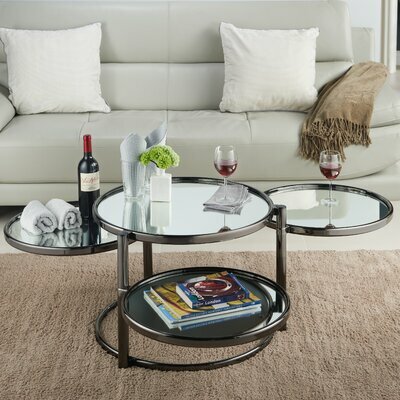 This graceful coffee table features clear glass top and black finished metal base. Perfect for versatile placement, it is round in shape and finished on all sides. This sturdy coffee table requires some assembly upon arrival. Its maintenance is also hassle free; just an occasional wiping with a dry cloth will do to keep this table gorgeous and sparkling. Featuring a round glass top and naturally shaped, unfinished teak driftwood base, the Cindi Driftwood Coffee Table is sure to create a striking focal point in any room of your home. Perfect for your sunroom or living room, this coffee table offers organic appeal and exudes an aura of freshness all around. Add flair of style and fun with the impressive and chic Pradyoth Coffee Table. Featuring LED lights with 6 transitional colors, this round coffee table is sure to become the highlight of all the parties at your place. Manufactured from glass and chrome finished metal, it is strong and durable for years of reliable use. Give a flashy look to your room with the Daphne Coffee Table. Artistically crafted from chrome finished iron, this stylish round coffee table is sure to become eye-catching focal point in your home. Its unique design adds gorgeous detail to your room while sturdy construction promises years of reliable use with maximum durability. The Daniela Table will add flair of style to your room with its chic look. 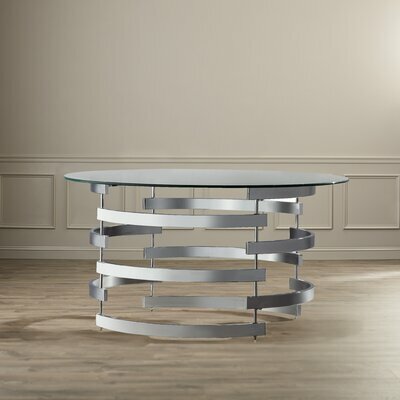 It features bright chrome finished rings and scratch-resistant glass top. 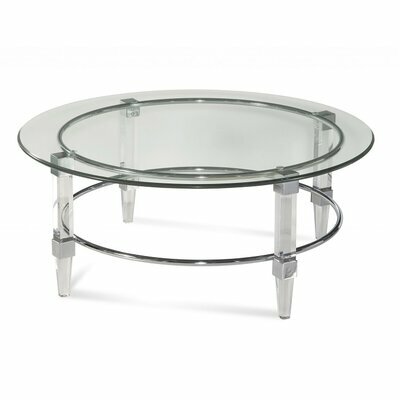 Sturdy acrylic legs with tapered feet and leg capture blocks support the base and round glass top. Decorative and elegant, the Astorga Coffee Table is a unique piece of furniture. 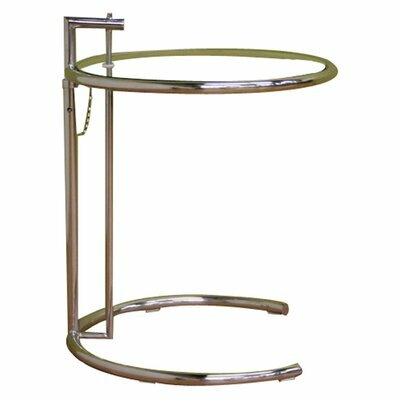 It is made by welding curved steel rods to the horizontal circular frame. Clear tempered glass sit atop the nickel finished base. Place this coffee table in your living room or guest room and impress your guests with its hard-to-miss enchanting design. Featuring a trio of faux ebony cherubs, with gilded gold accents and cabbage-rose center finial, the Louis Coffee Table from the house of Design Toscano is sure to become the mesmerizing centerpiece in your home. Crafted from weatherproof resin, this charming coffee table is durable and promises many years of reliable use. Round in shape, it is perfect for central placement. It features clear round glass sit atop the base offering crystal clear view of the dazzling base. Spellbound your guests with the enchanting look of this coffee table and win their compliments. Made from durable stainless steel, the Balthazar Coffee Table from the house of Wholesale Interiors is multifunctional accent table. 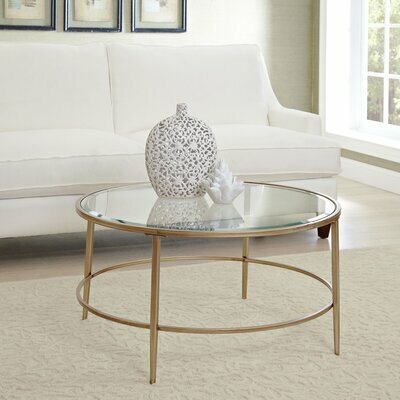 Featuring modern style, this round coffee table has adjustable height. The elegant Balthazar Coffee Table promises a touch of style and grace to adorn any room where it is placed.